An original and novel way of knowing our coasts, reaching hidden places and enjoying at the same time its spectacular seabed. Whether by day or in the light of the moon, combining it, if you wish, with snorkeling excursions, enjoy naturally and respecting the environment, the most beautiful places on the island. And if you prefer to play with the wind, you can also learn from the hand of our best windsurfing experts to sail on sea in a safe and fun way. Pick up at the hotel and transfers included. The transport from Mogán has a supplement of € 5 on the PVP to be paid on the pick-up bus. Tell us the date you prefer and we will organize the SUP and Windsurf Gran Canaria spots. Activities are organized in the center from 9am to 4pm. Tell us the time you prefer to be picked up at the hotel and we will confirm the definitive schedule of the start of the activity. * Transportation from Mogán has a supplement of € 5 on the PVP to pay on the pick-up bus. Surf Maspalomas currently has the only boat in the Canary Islands prepared specifically for this sport and so practice it with maximum safety (To practice this sport, first of all it is very important that the boat is inboard inverted tail, practiced with outboards or intra-out engines (tail) is highly dangerous). Equipped with systems that help control speed and generate a higher, longer and cleaner wave. Wake surfing is a drag in which the wave of a boat is used to surf. 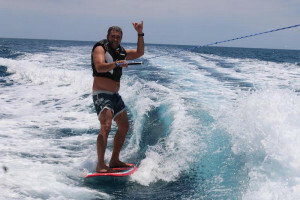 At the start of the activity a rope is used to get out, either from the water or from the stern platform of the boat, which is later released when the proper speed has been reached and a sufficient wave has been formed to drag the board and surf .